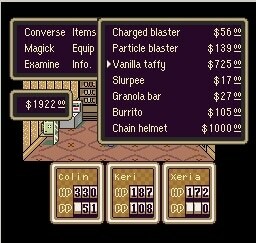 Been a while since I last posted about an EarthBound hack! 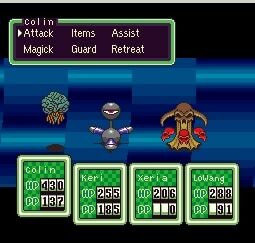 This latest one is called “Colinbound Infina’s Invasion” and is a pretty-heavily hacked version of the game – nearly all of the plot and text has been changed, not to mention the usual stuff like new enemies, places, events, etc. It took DarkUmbreon a few years to complete it. Sometimes EarthBound hack patches are tough to get working right, so if you’re having trouble getting this patch to work, try using the Easy EarthBound Patcher. Is it odd that I expected to find a hack on this page centralized around Colin Mochrie? Is it just me or do the places look exactly the same :/ I hope its a total conversion. Wow! Awesome! There hasn’t been a full hack since Jonbound right? I’ve been waiting so long for another full hack! Glad to see enemies from other series make an appearence, that’s really cool. I believe you mean Hairman. About to fight the “Sharks”, so far the hack seems pretty cool. Only one thing I don’t really like so far, quite a bit of the npcs around “Onett” Don’t have anything funny to say, they just say very generic things. There are funny npcs, but quite a lot of them aren’t. Map hacking is quite complex in Earthbound… I am guessing that it would have taken quite longer if locations were completely changed. But I’ll definitely check this out. @blahmoomoo Yeah, at one point I wanted to make a map hack of Earthbound, only changing the maps, nothing else. But then I realized I don’t know enough about hacking, or PK Hack. I’m really looking forward to Unearthed, it’s gonna be so much more then just a map hack. Hey, I posted about this a while ago!!! @Earthbound_X: Agreed, much more than the map is being changed. 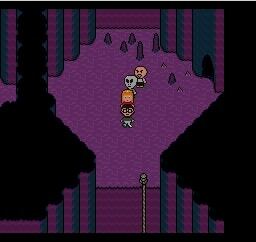 It looks like a change in nearly everything about the game, while keeping the graphics in Earthbound’s general style. @meleemario: It’s not that I wanted recognition for “finding this”, or something. I admit my previous post sounded a bit…. weird, but this is a very well known project by now. On the other hand, just by emailing the hacker telling him about the bug, you should appear on the staff roll, as a beta tester!! I’m also looking forward to Unearthed! When you get attacked while climbing, you get on a battle, right? Found my first glitch, it’s a tiny one though. If you try to go through the tunnel to Garson on foot, when the rats punt you out of the tunnel, two ghost show up to kick you out, I’m guessing he forgot to change those ghosts in rats. Actually, I didn’t forget. I just couldn’t find the ghost sprite. Oh OK, just thought I should mention it. For some weird reason, (no a giant pencil isn’t blocking the way!) my internet messed up, and it started playing the video in fast motion! The hack looks pretty neat! You can tell a lot of hard work and effort went into it. I am confused as to why the creator has not recieved the PK Hack badge. I found a glitch. In Lockport there is a scene where Keri’s dad runs down the street calling for her, after you leave the motel. After that anytime I try to initiate a text option the game freezes. Anybody else have this problem? Yes, I know about that bug and I fixed it. Just download the IPS file off my website again. Can you just apply the fixed IPS to the same ROM file? OK, I’m past that part where the bug would happen anyway, so I should be fine. Thanks, that fixed it. I really like this hack. Keep up the good work. One thing. Change the Psychic Points to Magick Points. It doesn’t make since that using Magick uses Psychic Points, or at least to me it doesn’t. 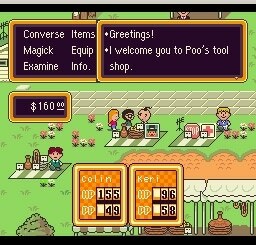 Wanna say nice hack you did here, been an Earthbound fan since the mid 90’s. 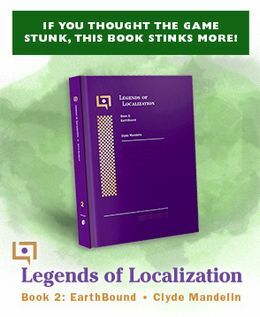 I got some questions: Do you have a strategy guide to with this? I pretty much know where to go based on the original game, but enemies will drop better stuff and some enemies are tuff (which is good). Keep up the good work :), looking forward to other hacks by you Colin and the Earthbound Community. @NeoNess I’ve had it freeze once, I just beat Robert, and I was going into the cabin to save the girl(Can’t remember her name off the top of my head) and it froze, though I just loaded a state, and it was fine the next time. I was using Windows 7, and ZSNES. I think it may have froze, because right before I went into the cabin, there were about 6-7 Living Gas enemies outside, which was lagging the game a ton. The next time I went into the cabin, after loading a save state, they weren’t there, and it worked fine. Heh heh heh… Poo’s tool shop. Yay references to the game he hacked! It’s very unique how he kept everyone from Earthbound in the game. Ness is the hint guy, which makes perfect sense because he’s done this adventure; Paula is the replacement of Venus, which also makes sense; and Jeff is the replacement of the weapons dealer, which again makes sense, because he was the only one that could use them in EB. I have a bug to report, though. I am on Mt, Koi (replacement for Dalaam) and then Dawn (replacement of Ness’s dad) calls. I say no, that I don’t want to quit, but then the text box says Xeria is talking, but it’s supposed to be Lo Wang. You might want to fix that. Also, like I said above, you might want to change PP to MP (also change Psychic Points to Magick Points) and edit the PP on the HP/PP boxes to MP, which I did myself, but the M looks very crappy IMO. Also, I have a glitch to report. The Bazooker’s death text is glitched. You might want to check into that. That second screenshot showing three enemies at once…wait, is that a Brain from Final Fantasy II? este juego es bueno para los niños no para los adultos porque se veria absurdo ver a un adulto como niño mocoso asi como mi padrastro!! this game is not good for kids to adults because it would look ridiculous to see an adult brat child as well as my stepfather!